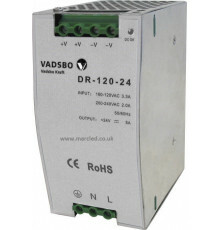 120W 24VDC Switching Power Supply for DIN Rail Mounting. Built-in protection against short circuiting, overload, over-voltage with automatic reset when error is corrected. Obvious areas include all types of operating equipment. DR power supplies also specially suitable to drive LED stripes. 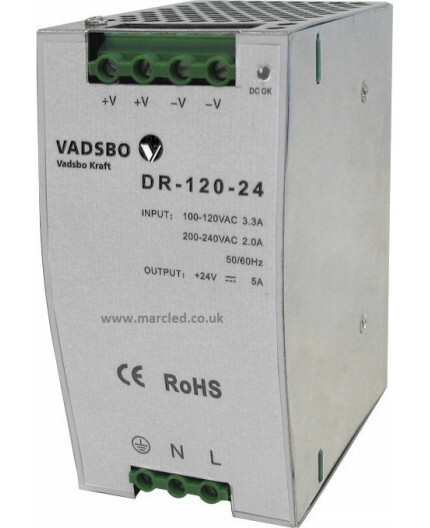 To dim stripes, use Vadsbo's LED dimmer PWM360A (V-4036020PWMA).